An article in today’s Times notes, for example, that “no American president since Franklin Delano Roosevelt has won a second term in office when the unemployment rate on Election Day topped 7.2 percent.” That was the unemployment rate in November 1984, when Ronald Reagan resoundingly won a second term. This type of data may be of limited use for predictive purposes, however. Reagan won re-election by 18 points, suggesting that he had quite a bit of slack. An unemployment rate of 7.5 percent or even higher would presumably have been good enough to win him another term. It’s also not obvious that Roosevelt should be excluded from the calculus, particularly given that the economic crisis the country is working its way out of now is the most severe since his administration. 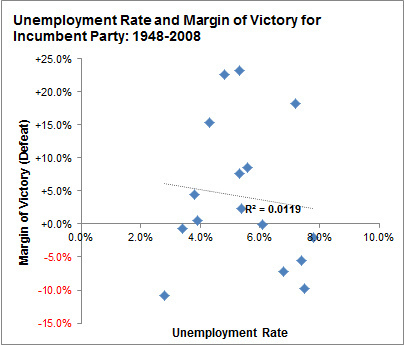 He won re-election in 1936 with an unemployment rate of 16.6 percent, and again in 1940 with a rate of 14.6 percent. For Roosevelt, at least, the unemployment rate was headed in the right direction: down from 19.8 percent in 1933, the year he took office. This was also true for Reagan, although only barely so: he inherited an unemployment rate of 7.5 percent from Jimmy Carter, seeing it drop to 7.2 percent in time for his re-election. The unemployment rate when Mr. Obama took office was 7.8 percent — and he may not follow in his predecessors’ footsteps by leaving it in a better place than he found it. As of last month, private forecasters like Wells Fargo and The Wall Street Journal‘s forecasting panel were anticipating an unemployment rate close to 7.8 percent by late 2012. But those forecasts preceded a bevy of poor economic reports, which may lead some economists to lower their estimates. Looking at unemployment in this way — as the rate of change over a president’s term — is probably the more worthwhile approach. But it, too, is not always reliable. Unemployment increased by 1.9 percentage points over the course of Richard M. Nixon’s first term, but he won re-election easily. It also increased in George W. Bush’s and Dwight D. Eisenhower’s first terms, and their re-election bids were also successful. The unemployment rate fell to 3.9 percent from 5.3 percent, meanwhile, in Bill Clinton’s second term — but his vice president, Al Gore, could not beat Mr. Bush in the Electoral College. 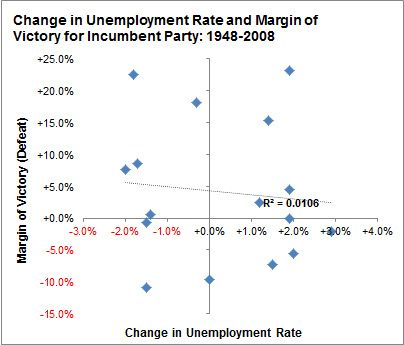 There are also cases in which the data behaved more intuitively: Jimmy Carter and the elder George Bush all faced high unemployment rates when they lost their re-election bids, as did Gerald R. Ford in 1976, and that was surely a factor in their defeats. 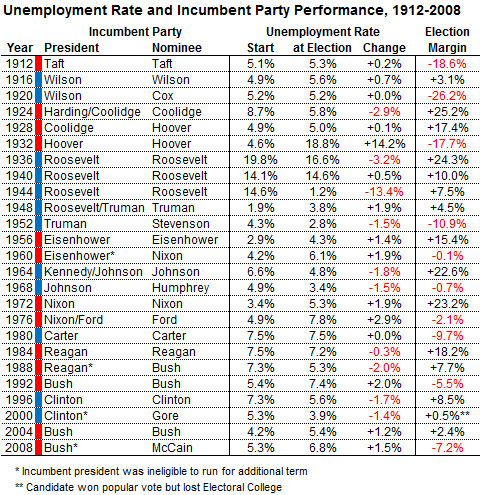 But historically, the correlation between the unemployment rate and a president’s electoral performance has been essentially zero. In the chart below, I’ve provided unemployment data for the last century’s worth of presidential elections, comparing the unemployment rate on Inauguration Day to the one that the president (or the incumbent party’s candidate) faced on Election Day. Data for 1948 onward is on a monthly basis, while only annual estimates are available before then. Another approach is to look only at those cases in which a president, like Mr. Obama, served a full, four-year elected term and was seeking a second one. This cuts the number of data points down to 11 from 25. It does not, however, improve the correlations much, although the second graph — which evaluates the change in the unemployment rate for elected presidents seeking a second term — is somewhat more promising. 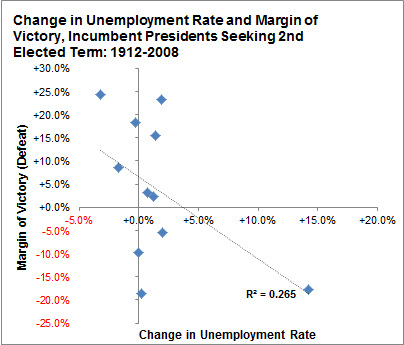 Perhaps if you go through enough iterations of this exercise — which range of years you look at, which presidents were elected or which ones assumed the office through death or resignation, where you define the starting point and endpoint of a president’s term, which of the several unemployment data series you use — you can get the correlations up a bit higher. But almost no matter what you do — even if you’re more or less deliberately cherry-picking — they range from zero to fairly weak. So does that mean that the unemployment rate should just be ignored and that the news media’s focus on it is misplaced? No, I think that’s emphatically the wrong interpretation. The data is not really strong enough to prove there is a relationship — but because there are a relatively limited number of data points, it is also not strong enough to disprove that there is a relationship. In these cases, it is entirely permissible to default to common sense, which is that the unemployment rate should have some effect on a president’s re-election chances. 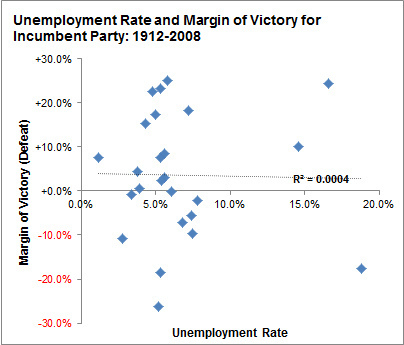 The unemployment rate itself is subject to fairly significant measurement error. Voters will interpret the unemployment rate in different ways, and assign the president varying amounts of credit or blame for it. The unemployment rate is but one of a number of salient economic indicators. Economic performance is but one of the ways that voters evaluate a president. Voters’ evaluation of a president is important, but they also consider the strength of a president’s opponents, including third-party alternatives in some elections. If you could hold each of these other factors constant, you could come to a more confident conclusion about how much each tick in the unemployment rate affects Mr. Obama’s re-election odds. But the real world is not set up with these sorts of experiments in mind, and since presidential elections are infrequent, the likelihood that truly comparable cases will exist in the historical data is relatively low. 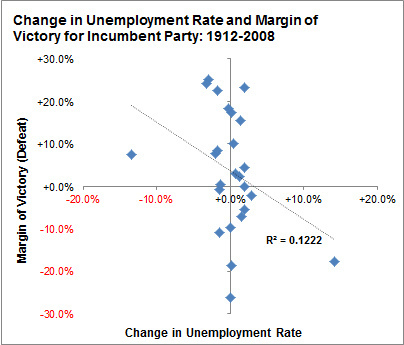 Some political scientists prefer other economic indicators to the unemployment rate, and there is evidence that measures like growth in real disposable income do a better job of predicting election results. Here, too, however, we ought to be cautious. There are literally thousands of plausible models that one might build, using different economic indicators measured in different ways and over different time periods, taken alone or in combination with one another, and applied to different subsets of elections that are deemed to be relevant. Some of these models, through chance alone, will produce a better fit on the historical data — but the relationships may be spurious and their predictive power will sometimes not be as strong as claimed. Even the most thoughtful, well-designed models — I like this one, for instance — can see their performance deteriorate quite substantially if small, seemingly benign changes are made to their assumptions. Working with data like this gets tricky. We have a good sense for the cards that Mr. Obama holds — the different factors that will work for and against him — but our idea of how the hand will play out is quite fuzzy, and the rules of the game may change from election to election. Clearly, Mr. Obama’s odds will be impaired if his hand contains more deuces and treys than aces and kings — and that, in essence, is what weaker data from the labor sector implies for him. But this is an inexact science — more so than either journalists or political scientists tend to acknowledge.